CHAPEL HILL, Tennessee (May 27, 2016) – The future of approximately 53 acres of land along Nashville Highway in Chapel Hill may become a little clearer after the land sells in an absolute auction on Thursday, June 16, with Sims Commercial Realtors & Auctioneers conducting the live event. The land is currently zoned B-2 (Intermediate Business), which permits a wide range of uses such as health care, education, cultural, recreation, and retail. “With more than 1,000 feet of frontage on Nashville Highway, it’s certainly suitable for commercial development. But it’s also bordered on the north by Chapel Hill Elementary School, and it’s just a few blocks from Forrest High as well. So with appropriate rezoning, it would also be very suitable for residential estates,” said Larry Sims, broker for the auction company. 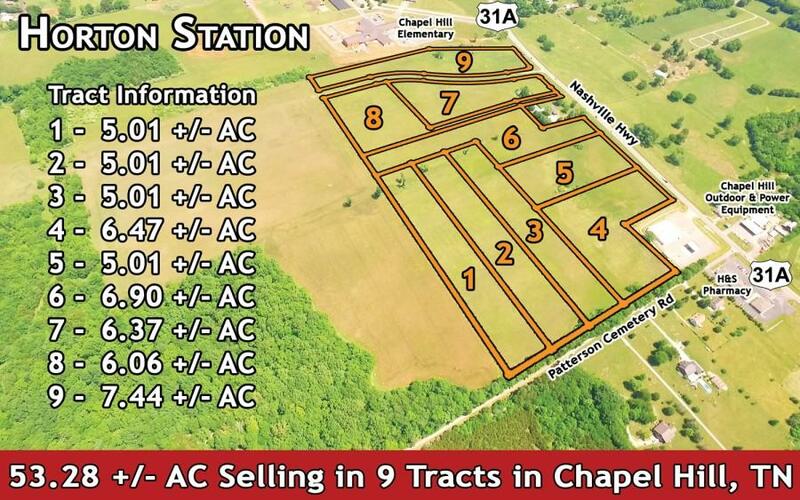 Tracts range in size from 5.01 acres to 7.44 acres. “Chapel Hill is really an undiscovered gem where people can enjoy peace and quiet without the clutter of the city. Yet, it’s only a half hour to Franklin or Murfreesboro,” said Sims. All of the land could go to one bidder, or it could have as many as nine buyers. “By dividing the land into tracts, we’re making it possible for people to bid on just the land that suits their budget and needs. People can bid in any combination from a single tract to the entirety,” said Sims. The auction will begin at noon on June 16 at the property, at the corner of Nashville Highway and Patterson Cemetery Road. Additional information, including aerial photography, video, surveys and utility maps, is available at larrysims.com, or by calling 615-893-5252. Showings are available by appointment. Larry Sims Auction Company, based in Murfreesboro, offers commercial and residential real estate through both auctions and private listings.